Medical language can be complicated and confusing, but at Couser Orthodontics we like to make things as simple as possible. We have assembled a list of common dental and orthodontic terms to help you better understand your treatment. Use this dictionary as a reference guide as you browse our website. Learn how we can give you that perfect smile. We have added lots of interesting infographics and information to keep you better informed! Anterior Teeth The upper and lower six front teeth on each arch. Appliance Anything your orthodontist attaches to your teeth that moves your teeth or changes the shape and/or position of your jaw. Arch The entire upper or lower jaw. Archwire The metal wire that connects orthodontic brackets. This wire guides the teeth into their new alignment. Bands Metal bands (rings) that are generally cemented around the back teeth. Bond The seal created by orthodontic cement that holds your appliances in place. 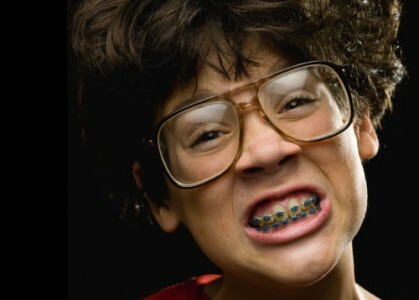 Braces Fixed orthodontic appliances designed to align teeth. Bracket The tiny metal, ceramic or clear button that is affixed to each individual tooth on the arch. Buccal The outer (cheek) side of posterior teeth in the lower and upper arches. Cephalometic X-ray An x-ray of your head that shows the relative positions and growth of the face, jaws, and teeth. Chain Elastics connected together and placed around the brackets to stabilize the archwire and gently close spaces. Class I Malocclusion Molars are correctly aligned, but there is an anterior/posterior crossbite, an openbite or overcrowding on the arches. Class II Malocclusion Also known as an overbite. The upper front teeth are positioned further forward than the lower teeth. Class III Malocclusion Also known as an underbite. The lower front teeth are positioned further forward than the upper front teeth. Closed Bite The upper front teeth completely overlap the bottom teeth causing a deep overbite. Coil Spring A spring that fits between your brackets and over your archwire to open space between your teeth. Crossbite A malocclusion in which the upper back teeth bite inside or outside the lower back teeth, or the lower front teeth bite in front of the upper front teeth. De-banding The removal of orthodontic bands from the teeth. De-bonding The removal of affixed orthodontic brackets from the teeth. Dental Recontouring Also called odontoplasty; a simple form of cosmetic surgery to reshape the contours of the teeth and make them more even. Diagnostic Records Records used to assess, plan and implement treatments. These records usually include medical and dental history, radiographs, panoramic radiographs, bite molds and intraoral/extraoral photographs. Digital Radiograph Digital x-rays of the teeth which can be viewed, stored and transmitted via computer. Elastic A small rubber band that is hooked between different points on your appliance/braces to provide pressure to move your teeth and jaws to their new position to align your bite. Elastic Tie The rubber band that fits around your bracket to hold the archwire in place. These come in a variety of colors. Fixed Orthodontic Appliances Orthodontic appliances which are affixed to the teeth by the orthodontist and cannot be removed by the patient. Functional Appliances Orthodontic appliances that claim that they can bring the lower jaw forward. This claim is not supported by the orthodontic research. Gingiva The gums and soft tissue around the teeth. Headgear A removable appliance comprised of a brace and external archwire. This device modifies growth and promotes tooth movement. Impressions The process of making a model of your teeth by biting into a soft material that hardens into a mold of your teeth. Your orthodontist will use these impressions to prepare your treatment plan. Interceptive Treatment Treatment performed on children who have a mixture of adult and baby teeth. Early treatment can help reduce the need for major orthodontic treatment in the future. Invisalign® An alternative to traditional braces, Invisalign® straightens your teeth with a series of clear, removable, custom-molded aligners. Ligating Modules An elastic donut-shaped ring which helps secure the archwire to the bracket. Ligation Securing the archwire to the brackets. Lingual Side The side of the teeth (in both arches) that is closest to the tongue. Lower Expander A device that makes your lower jaw/bone that teeth sit on wider. Malocclusion Literally means “bad bite” in Latin, and refers to teeth that do not fit together correctly. Mouthguard A removable plastic or rubber device that protects teeth and braces from sporting injuries. Odontoplasty (Dental Recontouring) A simple form of cosmetic surgery to reshape the contours of the teeth and make them more even. Open Bite Upper and lower teeth fail to make contact with each other. This malocclusion is generally classified as anterior or posterior. Orthodontics The unique branch of dentistry concerned with diagnosing, preventing and correcting malocclusions and jaw irregularities. Orthodontist A dental specialist who prevents, diagnoses and treats jaw irregularities and malocclusions. Orthodontists must complete two or three additional years of college after dental school and complete a residency program. Palatal Expander A device that makes your upper jaw wider. Panoramic X-ray An x-ray that rotates around your head to take pictures of your teeth, jaw and other facial areas. Plaque The sticky film of saliva, food particles and bacteria that contributes to gum disease and tooth decay. Removable Appliance An orthodontic brace or device that can be removed at will by the patient. It must be worn for the designated amount of time each day to be effective. Retainer An appliance that is worn after your braces are removed, the retainer attaches to your upper and/or lower teeth to hold them in place. Some retainers are removable and others are bonded to the tongue-side of several teeth. Separator (or Spacer) A small rubber ring that creates space between your teeth (usually molars) before the bands are fitted and attached. Space Maintainer A fixed appliance used to hold space for permanent (adult) tooth. This is usually used when a baby tooth has been lost earlier than anticipated. Wax Orthodontic relief wax is a home care remedy used to alleviate irritations caused by braces. Wire The metal wire that acts as a track to guide your teeth along as they move. It is attached to the brackets to gently move the teeth into proper alignment. It is changed periodically throughout treatment as your teeth move to their new positions.